High pressure is currently center over Minnesota with an area of low pressure with a trailing cold front in Saskatchewan. That particular system will be the next precipitation threat for North Dakota and western Minnesota. Although far western and northern North Dakota may record some moisture later today into especially tonight, a vast majority of the area will have a pleasant albeit a touch breezy (south) Friday. A projection of that potential rain/thunder today is presented below via an animation off the HRRR (High Resolution Rapid Refresh) guidance. More storms expected in the central Great Plains into the Great Lakes region, and locally, some hit and miss storms firing near the cold front in far western and northern portions of North Dakota. The better threat for rain today will come across southern Canada. By tomorrow afternoon that cold front will be in central North Dakota and with it hit and miss thunderstorms. Because of the larger storm foreseen in the central plains, moisture advection into this cold front will be minimized, therefore, precipitation amounts overall are looking light, with the traditional isolated pockets. It will be a bit breezy from the south in eastern North Dakota and western Minnesota ahead of the front and a bit breeze from the west/northwest behind the front in western North Dakota. By Sunday morning that front is expected to be in eastern North Dakota through northwestern Minnesota. Morning showers / storms are possible and depending on the exact placement of the front in the afternoon, some additional storms are possible on Sunday afternoon, especially in Minnesota. 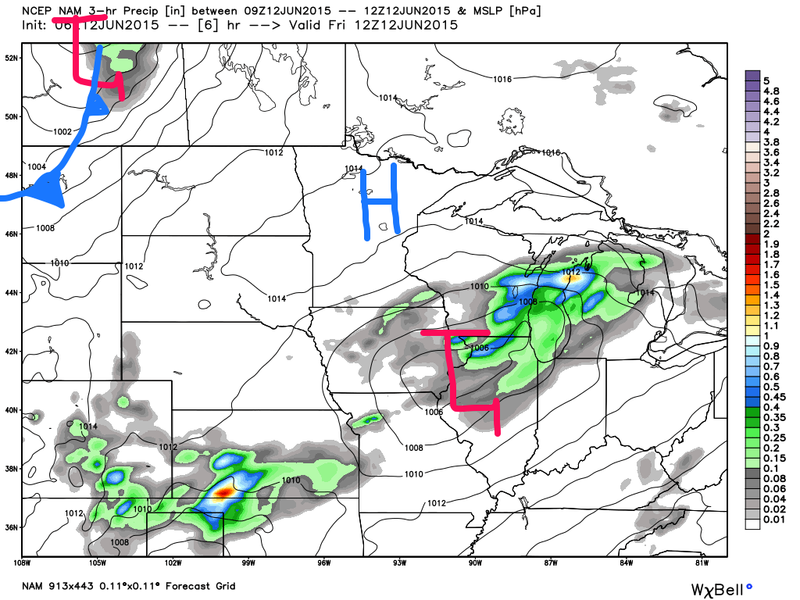 Although several mentions of rain, it should be emphasized that much of the weekend will be dry and Saturday in particular fairly warm in the eastern part of the state into western Minnesota with 80° + potential there, but behind the front, most locations only in the 70s on Sunday. That cold front will be pushed through the state as a large ridge of high pressure aloft develops over Alaska. With a surge of warmth into a Alaska, the jetstream will buckle downstream and form a trough (low pressure) over the northern Rockies. That in turn should produce an area of surface low pressure that will move somewhere over the northern plains during the Tuesday and Wednesday time frame. This pattern can produce persistent cloud cover, cool temperatures, rain and the associated longer periods of high surface Relative Humidity. Although confidence is high for this all to transpire, where exactly the precipitation will fall is still in doubt. But it does appear that the stretch of sunnier pleasant weather may temporarily end for a couple of days at least next week. Highest potential time frame for this change will be Tuesday/Wednesday. But even with some hit and miss showers/storms this weekend, overall the next 4 days will bring fairly pleasant conditions. Beyond that cooler period expected next week, The end of June into early July continues to look promising for above average temperatures and lower frequency of rainfall.